“You see, there was a time when Elephant had no nose. 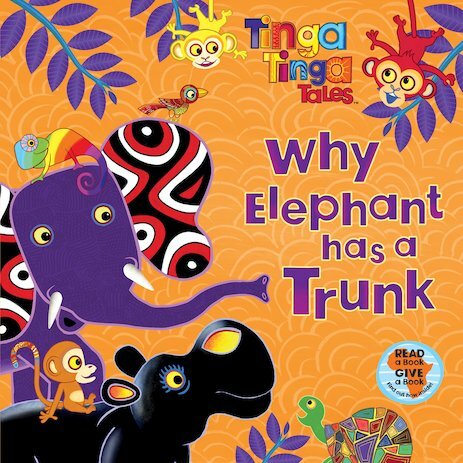 He was big, he was clumsy and he was very, very SMELLY!” Come to Tinga Tinga, the land of stories and surprises, to find out how Elephant was turned from a smelly, dirty creature with a short, stubby nose into the glorious beast we know today. When Elephant’s nose gets “snapped” by a grumpy Crocodile, it is stretched and stretched until it is a very useful long, wiggly nose indeed! TERRUMPETT! An African folktale is vibrantly retold for curious tots in this richly colourful story of how the elephant came to be, inspired by the indigenous Tinga Tinga art of Tanzania. Colour Tinga Tinga’s chameleon – what colour is he today? Lion knows everything in Tinga Tinga! Here’s a picture for you to colour. Colour Tinga Tinga’s three cheeky monkeys!